The name given to the villages Aznalfarache, Aznalcazar, and especially Paterna, situated in the neighborhood of Seville, presented by Alfonso X. (The Wise) of Castile, while still infante after the conquest of Seville (1248), to those Jews who had taken an active part in the battles against the Moors, or who in any other way had rendered assistance to the conqueror. Other valuable gifts, such as fields, olive-and fig-orchards, etc., were bestowed upon the almojarifes (tax-farmers), Don Zag (Isaac) and his sons, Don Moses and Don Abraham, upon several of the Alfaquin family, an unnamed rabbi, Don Joseph of Lisbon, and upon many others. Paterna was known for a long time as Aldea de los Judίos (J. Amador de los Rios, "Hist. de los Judίos," i. 370 et seq.). According to the accounts of Gedaliah ibn Yaḥyah, Don Yaḥyah ibn Yaish, the progenitor of the Portuguese Jewish family Ibn Yaḥyah, received as presents from the king of Portugal, who highly esteemed him, several aldeas, such as Priala (see Kayserling, "Gesch. d. Juden in Portugal," p. 2). 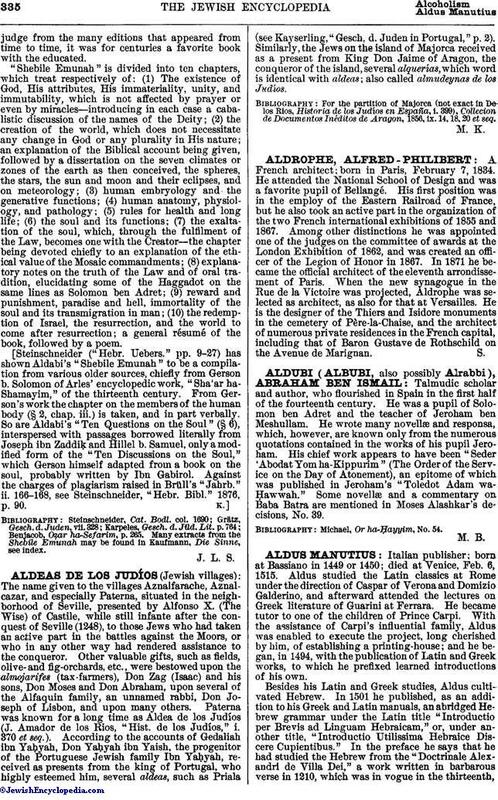 Similarly, the Jews on the island of Majorca received as a present from King Don Jaime of Aragon, the conqueror of the island, several alquerias, which word is identical with aldeas; also called almudeynas de los Judios. For the partition of Majorca (not exact in Delos Rios, Historia de los Judίos en España, i. 399), Collecion de Documentos Inéditos de Aragon, 1856, ix. 14, 18, 20 et seq.